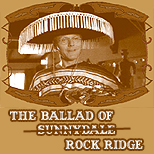 Summary: BtVS meets Blazing Saddles. Sunnydale only pawn in game of death. Rated PG-13 for language. Notes: Yes. Yes, I am insane; thank you for noticing. Once upon a time, there was a sleepy little western town. Then some bad guys came along, and all hell broke loose. Sort of. Constructed reality, so please don't try to put the scenes in strict order of canonical chronology; you'll only hurt your head. Words and music by Mel Brooks, recording by Blazing Saddles cast. Buffy the Vampire Slayer footage copyright Joss Whedon and Mutant Enemy Productions. Used without permission for personal entertainment only; no profit made. No stinking badges needed.